January 2008: We’ve been working with Canarvon Elementary after school club to help teach kids about sustainable alternatives to everyday things, and we’ve been teaching ourselves a thing or two on the way as well. 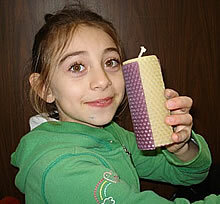 The first week we made beeswax candles as a healthier and green alternative to paraffin candles. Rolling the beeswax was super fun and easy and smelled so good, I reckon anyone from 5 years up cold do it with a little help. The kids got really creative with decoration and we had hearts, spirals, stripes, all sorts of things. Great success. Plus they got to take their candles home and tell their mums and dads why they are sooo much greener than paraffin candles. Isabel and Suz doing their thing for Rocky Mountain Flatbread Education Society. 100% pure beeswax is non toxic, clean burning and hyp0-allergenic. This is because the negative ions attach to the positive ions that hold in dust, smoke, odor, molds, germs and bacteria. Once attached, the positive ions and weighted down and this drops both the ions and the contaminants to the ground to be swept or vacuumed away! Soooo cool. And they burn 3 x longer than paraffin candles. Traditional paraffin candles which contain petroleum burn soot and toxic compounds that are carcinogenic and can lead to poor air quality and increased allergies. The artificial vanilla fragrance, found in many scented candles, is actually piperonal, which is a lice killer. Breathing these synthetic fragrances damages the receptors in our nasal passages that detect scent, diminishing our ability to smell! Evil stuff.